It’s officially summertime, and that means fun in the sun for us at Sweet Deal!! When the weather warms up, we head out to the beach for summer parties but can also be found at home, lighting up the barbecue and having a great time with friends and family. We love to incorporate our consumer product clients and friends into our own barbecues, as well as the private parties we produce as part of our Event Planning Division. Here are some of our favorite snacks and drinks to satisfy everyone’s warm weather cravings! Vitamin Water – Not only does VM taste delicious, but it keeps you hydrated when the sun is beating down. We love the new line of Vitamin Water Zero that loses the calories, but keeps the same refreshing taste. 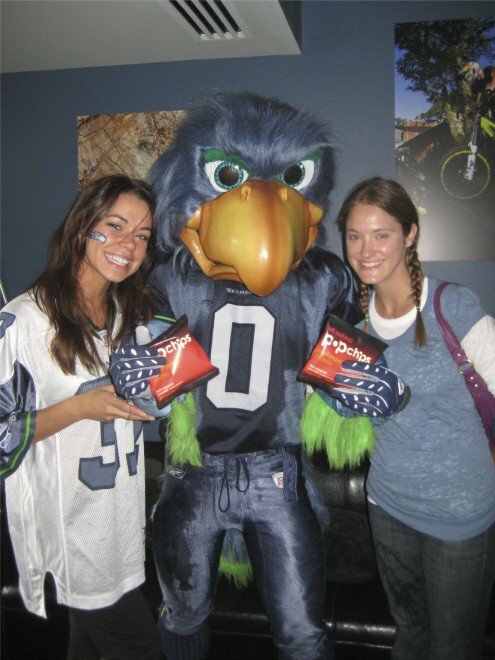 Sweet Deal brand ambassador Sara promoting popchips at a Seattle Seahawks game! popchips – Mmm, mmm good!! If you’ve ever popped one of Pop Chips’ flavors like Barbecue or Sour Cream & Onion, you know we’re right when we say these little tasty morsels are absolutely addicting. They are the perfect complement to your main barbecue dishes, be it a hamburger or hot dog. Seagram’s Sweet Tea Vodka – What’s better than lounging in the sun with a nice cool cup of lemonade? We’ll tell you what: spiked lemonade!! This Sweet Tea vodka from Seagram’s is our favorite brand to whip up some Arnold Palmers for grown-ups. Stick a colorful umbrella swizzler in, and you’ve got the makings of a great party! Savida Sangria – If you’re hankering for a fruity drink, our choice for a Spanish favorite is Savida Sangria. Cut up some fresh fruit (we recommend oranges, peaches, apples, and grapes!) and let it sit for awhile in the sangria, so the fruit really soaks up the liquid. 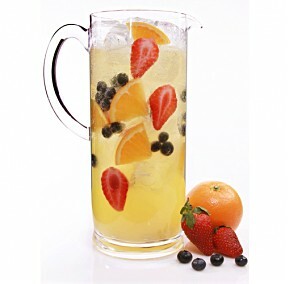 When it’s ready to serve, your guests will be asking for more pitchers all night long! Luna Bar/Clif Bar –Either for a healthy snack in the beginning of the night or a dessert to close the evening, these whole grain and tasty treats are great for adults and kids alike. flavors like Lavender, Lemongrass, and Vanilla Bean (amongst others), this is a perfect alternative to wine as it pairs very well with many types of food. Low in sugar and calories, this a perfect treat for a warm evening under the stars. We’re crazy for carts here at Sweet Deal! Yep, you read that correctly: we love CARTS! Ice cream carts, taco carts, candy carts, snowball carts, popsicle carts…you name it, we love it! Adding a cart to your special event or private party is a perfect way to create a memorable experience for your guests. As part of our Event Planning Division, we’ve used many carts to add some fun to our events. Check out the list of what you can do at your next party! Ice Cream carts ~ The mother of all carts is the scrumptious sweetness of everyone’s favorite: ice cream!! We can do ice cream, frozen yogurt, gelato, or packaged ice cream truck goodies from our chidhood. Snowcone carts ~ This is a great thing to have near the beach or pool party. Cool off with some shaved ice, and even have our beautiful staff create custom flavors for you. Mango-Kiwi, anyone?! We’ve pulled this cart to many golf tournaments, where it is a major hit. In the photo here, you can see our Sweet Snow Bunnies serving up some delicious flavors on a warm Southern California day! 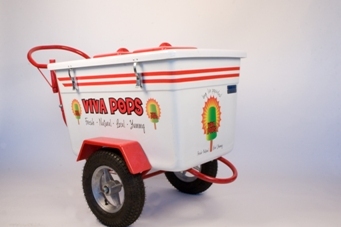 Popsicle carts ~ One of the newest types of carts around are popsicle carts! You can’t go wrong with the local and handmade pop- treats of I Love Viva Pops, based in San Diego. With flavors like Earl Grey with Lemon and Chocolate Banana, this one will surely be a winner! Popcorn carts ~ Screening a movie or putting on a Hollywood-style soiree? A popcorn machine will be a great addition to your event and will fit the theme perfectly. Add in movie style treats like Milk Duds and Licorice, and you have your own movie premiere in the making! Other ~ There are so many options for carts based upon your event’s theme. We can even get creative and make a custom cart specially for you! A cupcake cart, retro candy cart, taco and margarita cart…the list can go on an on. Plus, we can take the work off your shoulders by providing one of our Sweet Deal to staff to man the cart. They can even dress the part too! They will serve your guests and make sure everyone has a fun and delicious time! In the promo world, we have to always be on the search for innovative new ways to get a brand’s message to consumers. One of our favorite new ideas is putting our seasoned spokes models on roller skates!! Our skating spokes models head out to the beaches and urban areas to pass out flyers and drum up interest for a wide range of companies. They serve as ‘rolling advertisements,’ spreading a company’s brand message to areas not normally reached by traditional marketing. We recently did a promotion with AEG’s Latin Department, which is a huge entertainment company that own the likes of the Staples Center and more. They approached us with the hopes of spreading the news about the CD release of a popular Spanish rock band called Manà (see more about the band here: http://www.mana.com.mx/). Our models strapped into their roller skates and headed out to the Venice Beach boardwalk and Hollywood to visit record stores that advertised the album in addition to a CD signing party. They talked to music lovers about the CD release and passed out flyers with the goal in mind to get those waiting in line, as well as the passersby pumped up and excited about the band’s album signing and upcoming concert. They were truly attention grabbers with their rolling transportation and wings on their back that matched the CD’s cover artwork! We love to think out of the box for our street team promotions, and excited to now have our roller skating brand ambassadors working for numerous of our other clients! One of our favorite types of events to be a part of is golf outings! Whether it is a charity tournament or a casual foursome, our staff is consistently hired throughout the country to help events hit a hole-in-one. Our gorgeous and talented caddies have all the necessary golf trappings: water, snacks, good conversation, proper game etiquette, and knowledge of the game. Did we mention they also have a killer swing? From assisting your guests with club selection to chauffeuring your cart, these ladies will make your day on the course one to remember. We’ve also been involved in the creative planning of golf holes at charity tournaments. As part of our sponsorship division, we connect our consumer product clients with golf event planners. For our clients like Hacienda Vieja Tequila or Mike’s Hard Lemonade, sponsoring a golf hole is a great exposure opportunity for their product. 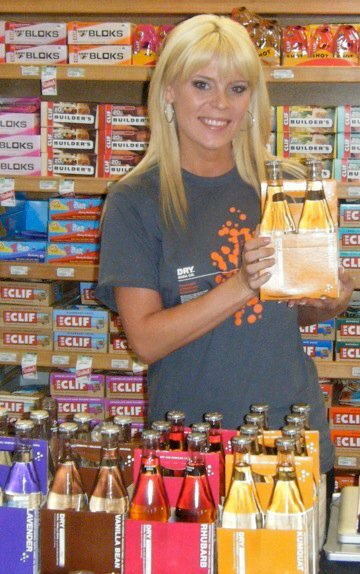 By sampling their product in creative ways, our clients reach hundreds of new consumers at each event. For the event planners, a product sponsor adds a memorable aspect to the golf holes and helps raise more funds for their chosen charity. When we link up our clients with golf tournaments, we love to get creative with their booth setup! 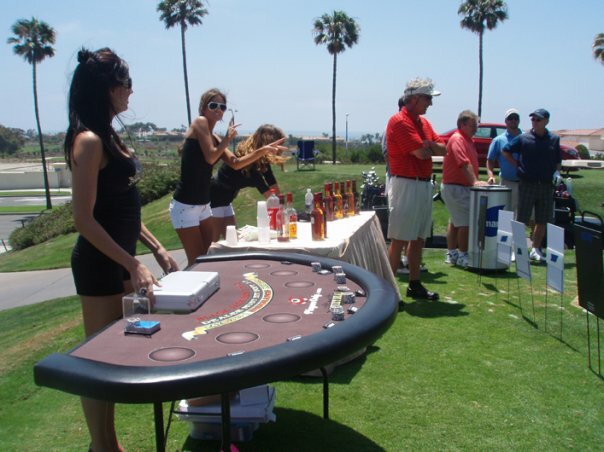 Be it a scotch tasting paired with a blackjack table or a lemonade stand with old-style lawn games, we love to highlight our creative marketing ideas to enhance our client’s exposure at the event. Our spokes models are always present, educating golfers on the brands and sampling products throughout the day. Summer is on its way and we are gearing up to celebrate it in sunny style! The Sweet Deal HQ is based in Redondo Beach, California, merely a mile from the beautiful Pacific Ocean. All of us here at the office are die-hard beach fanatics and you may even see us sunning on a beer patio near the Strand after a long week’s work! Our clients also love to take advantage of the crowds of happy sun-tanne rs near the beach so we find ourselves mixing fun with work often during the summer months, be it at a special event, street team or beach party. One of our most memorable summer events took place near Venice Beach when our beautiful bunnies sprawled out across the beach cities to spread the Coors Light love! The promotion was part of the Cold Front Glacier party marketing campaign, where a giant iceberg was floated in all the way from Long Beach to Santa Monica. Along with the iceberg came the first cases of Coors Light Cold Activated Can, which lets drinkers know when their brewski has reached the ultimate refreshing cooling temperature. Our beach bunnies dressed up in their Coors Light snow suits and walked throughout the city passing out flyers and getting people to join the party happening on the pier. With free Coors, live music and clear ocean views, it was a rockin’ day to remember for the thousands of Coors fans showing up to celebrate in summer style. We’ve also been a part of some great private beach parties as part of our Event Planning division! 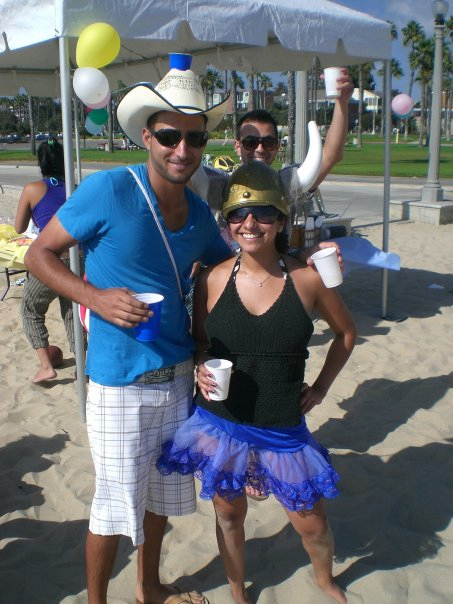 Last summer we produced a surprise birthday bash for a very special lady on Santa Monica beach. It was a day full of drinks, games, volleyball, good friends and a whole lot of fun. We pulled together multiple aspects of the event from start to finish: tent rental, snacks, drinks, and music. And of course, a beach party can’t be complete without the ultimate summer drink: SANGRIA! Our event hostesses cut up fresh fruit and mixed it into the sangria with a touch of peach brandy. No wonder this party went past its original ending time; we were all having too much fun in the sun! Try making your own peach sangria for your upcoming beach bash. We recommend this recipe to really get the party started! Fill a pitcher three-quarters of the way with ice. Add all the ingredients except the sparkling wine and stir well. Top with sparkling wine and garnish with blueberries, sliced strawberries and orange wedges. As the weather warms up and people’s spirits are high, there’s a lot of talk about sports seasons. From sitting in the sun at spring training games to rooting on our favorite college basketball teams, spring is the time for sports, sports, sports! One of the lesser known spring sports is horse racing, with its pinnacle being the Kentucky Derby happening only a few weeks away at the beginning of May! Horse racing isn’t quite the normal sporting event most people know about, but it is one of the longest standing traditions in our country’s sporting history. The Kentucky Derby first took place in 1831 and is the USA’s oldest thoroughbred horse races. It takes place in Louisville, Kentucky and is known as “The Most Exciting Two Minutes in Sports,” as a mere two minutes is all it takes for the stately thoroughbreds to complete the 1.25 mile stretch that stretches through the Churchill Downs racetrack. Not only is the Kentucky Derby the pinnacle of high-speed horse racing, but it is the pinnacle of high society! The social scene surrounding the Derby borrows from English societal traditions yet adds its own bit of Southern charm. Ladies step out in their fanciest spring attire, adorning themselves with bows, ribbons and the Derby signature of oversized hats. They walk around the course sipping the traditional drink of the derby, the Mint Julep, perfect for a warm spring’s day. The race is also known as the “Race for the Roses,” as the garland the winning horse is awarded is made up of beautiful roses. at Sweet Deal, we’ve put together special events with a Derby flair where people can enjoy the race and the atmosphere surrounding it from the comfort of their homes. We’ll bring in betting boards so your guests can pick their favorite horse, and we’ll even roll out a blackjack table and dealer for those in a gambling mood! A cigar station is a perfect addition to a spring day of betting, while our bartenders will whip up some tasy mint juleps for a refreshing treat. Our Special Event division will go even a step further and decorate your venue with luscious roses and fancy hats for your guests to pick from. A Derby Day in the sun is the perfect idea for a special event, charity fundraiser, or corporate party! If you are interested in hearing more about creating a Derby Day with Sweet Deal, please contact us at info@sweetdealin.com! We’re Mad (and made) for March Madness! As the weather drags its feet getting warmer, basketball season picks up the pace and Sweet Deal spokesmodels bring the heat that the sun is withholding. Can you believe we’re already in The Final Four?! While the last teams standing may be considered “unexpected” as followers of March Madness can learn from reading SB Nation, the most engaging, up-to-speed sports blog in the sphere, the energy and flair that our models bring to college basketball fans participating in a lively event to honor the season has come to be relied upon. Guests of the Sports Blog Nation party are the lucky recipients of the spirit, and (literally), CHEER, of Sweet Deal facilitators. Sometimes it takes a woman’s honed eye for detail to ensure that the best hospitality is provided. Therefore, our lovely ladies are present at events to make sure that every face is smiling and every thirst is quenched by a sweet drink. Samsung has come on board to sponsor the event and, most importantly, to provide adorable, peppy outfits for our models. March is mad, yes, but our models infuse even more frenzy into this sports extravaganza held at The Parlour, Midtown in Manhattan as they greet guests and attend to their comfort. Equipped with cute outfits, bubbly personalities, and sports knowledge, the models are a match made in heaven for events of this nature: supervising every operation from ensuring the most exciting music to providing up to date sports information covered by SB Nation, sweet deal moves the party down the court. Our models are well-acquainted with the fiery force that is sports fan-ship. They’ve got plenty of experience. In fact, this past fall our models directed a fun, successful Fantasy Football Draft for Yahoo Sports and Thrillist that featured snacks, Mikes Hard Lemonade, and the customary stellar company of sweet sports fans. Ben Hindiman, former National Events Director at Thrillist sent us this sweet note, “Just want to thank you (profusely) for yet again delivering a talented, friendly, charismatic, punctual and hard working group of staffers for my events. You always exceed my expectations with your staff choice and these ambassadors are no exception.” The tradition of food, flirty fun, and competitive sports that makes up the fabric of American life continues to sizzle with sweet models as the gracious hostesses. When we first tasted a sample of Chobani Greek Yogurt at the Natural Products West Expo in Anaheim last year, we knew we had found a new office snack favorite. It truly is a perk of our job here at Sweet Deal to be able to scope out and sample new and tasty products on the market! After being given a whole taste tour of their line at the Expo West, Chobani was definitely the stand out in my mind, and to this day I still make a special trip to pick some up at Whole Foods. If you haven’t eaten it before, Chobani is a scrumptious Greek-style yogurt in an array of flavors like Vanilla, Lemon, Blueberry, and my personal favorite Black Cherry. Unlike some other Greek yogurts out there, Chobani is all natural with 0% fat (they do have a 2% fat line if you a re wanting a little more Opa!). It also doesn’t have the same overly tart, chalky taste that Greek yogurts sometimes have. Chobani is creamy, rich with flavor, and quite a sweet (and healthy!) treat when mixed with granola or fruit. 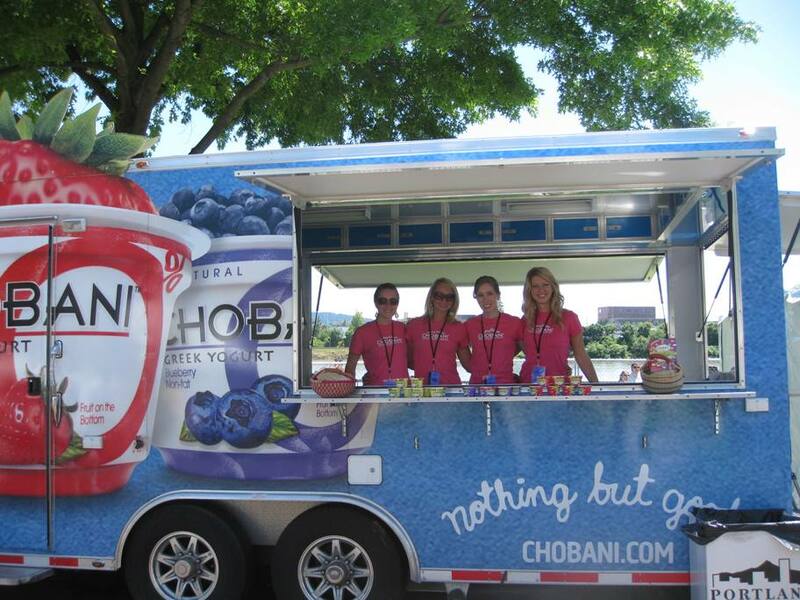 When we met the Chobani reps at the Expo West, they filled us in on their exciting plans for their “Cho-Mobile Tour.” The Cho-Mobile, a 26 ft. long blue bus, tours the nation and introduces the yogurt to thousands of people during festival season. We knew we had to get on this bus and we knew Chobani would be the perfect addition to our new division of promotional event marketing for non-alcoholic beverages and natural food products. 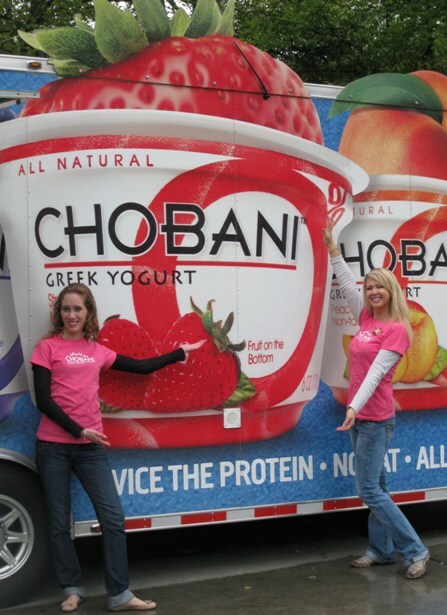 So, we partnered with Chobani and provided promotional staff at the ground-level of the festivals. From Portland to Seattle, Santa Monica to San Francisco, our Chobani spokes models handed out free samples at numerous healthy living festivals, marathons, and more. 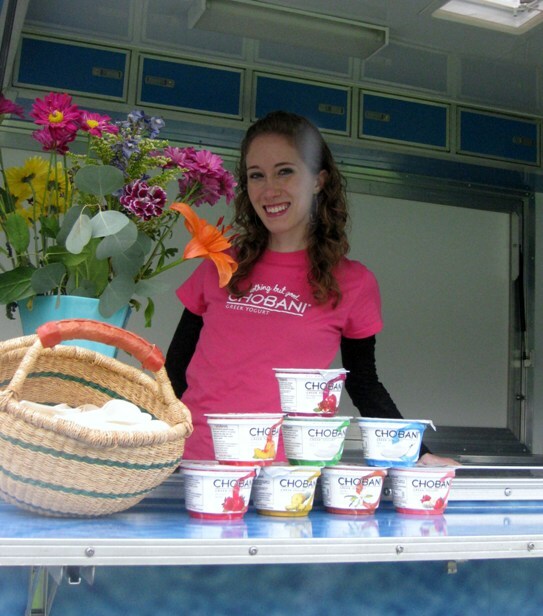 The festivals were a success in rain or shine as no one could pass up a tasty treat like Chobani! Now, Chobani is spreading the Cho-Love even further across the nation through their “Real Chobani Love Stories” marketing campaign. Chobani fans are encouraged to write their real-life story of their love for Chobani and submit it to win a free case of product! If you have your own love story to tell, head on over here to include yours!